She&apos;s walked runways and covered magazines, and now she&apos;s become a fashion installation. Leandra Medine--whose "Man Repeller" blog really needs no introduction at this point--scored a gig promoting Christian Louboutin&apos;s 20th anniversary and subsequently ended up doing the chicken dance in the windows of Saks Fifth Avenue. Taking a page from the Daphne Guinness book of department store "installations," Medine&apos;s version didn&apos;t take itself quite as seriously as Daphne&apos;s Barneys window display. According to Footwear News, Medine took requests from fans via tweets: She made "silly faces", performed the chicken dance, and tried on Louboutins for fans during her hour-long appearance. 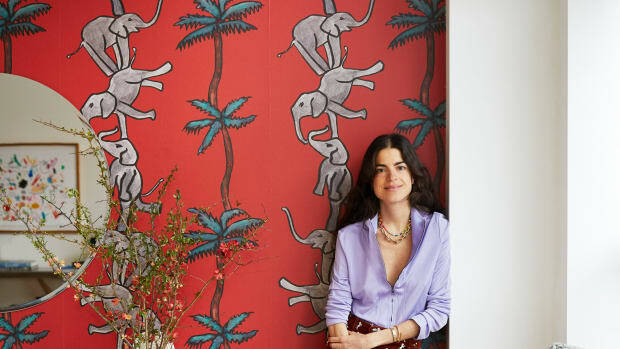 The founder of "Man Repeller" shows off her colorful new digs.